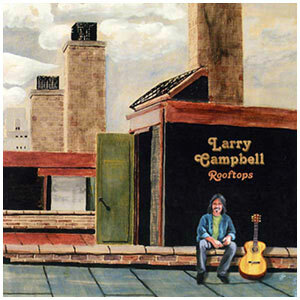 In 2005, Larry produced his first solo, all acoustic guitar album, Rooftops, which showcases his incredible skill with the acoustic guitar on a number of instrumental folk standards and obscurities. Larry wrote 2 songs for this project, one the title track. The other song he wrote was called "Henderson County". The coverart is a painting done a long time ago by Larry's father of the rooftop of the building Larry grew up in. (in New York City) With the help of a photograph by Linda McDonald and the artistry of Nancy Palermo, Larry was "painted" into the artwork. You can order the album at CD Baby. Here are some reviews of Larry's solo album, Rooftops written by some of Larry's fans. Also, read a review by Peter Stone Brown. No Depression magazine had a review of the album. Soundwaves magazine also had a review of the album. Atlantic City Weekly had a review here.